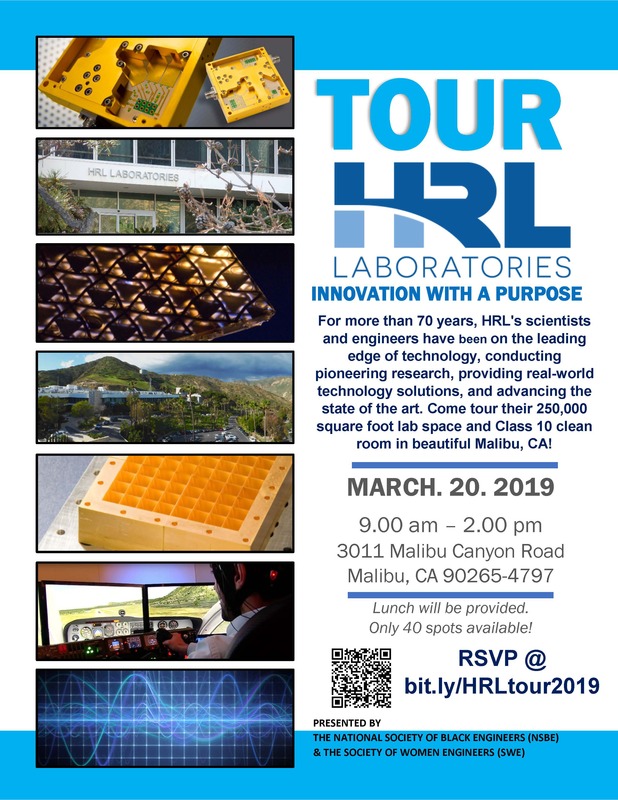 Tour HRL Laboratories Wednesday, March 20, 2019, 9:00AM-2:00PM NSBE and SWE would like to invite you to participate in a tour of HRL engineering and physical science research facility. For more information regarding this event, please refer to the event flier. NASA Glenn Research Center Internship Virtual Recruitment Webinar Thursday, December 6, 2018, 3:30PM The Office of Education (OE) at NASA Glenn Research Center (GRC) is having an Internship Recruitment Webinar to all interested faculty and students on Thursday, December 6, 2018 from 3:30 – 4:30 p.m. EST. For registration details, please refer to the Virtual Internship Recruitment flier. The registration deadline is close of business on Monday, December 3rd. The log-in/dial in information will be emailed to all registered participants on Tuesday, December 4th. For more information regarding the internship, please refer to the NASA Internship Program flier. WAVE Fellows Program at Caltech Webinar Wednesday, November 28, 11:00AM Caltech is excited to announce a summer research opportunity available to continuing undergraduate students. For more information, visit the official page or download the PDF letter here. Information & Communication Technologies Integrated Career & Academic Pathways Conference Thursday, Nov. 8, 2018 GCC will be hosting the Information & Communication Technologies Integrated Career & Academic Pathways Conference on Thursday, November 8, 2018. We encourage our students to attend to network with Industry professionals and learn about Cyber Security, Cloud Computing, Mobile Application Development and more! Local District Northeast STEM Fest Saturday, April 22, 2017 Roy Romer Middle School in North Hollywood is hosting the Local District Northeast STEM Fest. Come join the fun and learn about STEM education! Click here for an informational flyer.